Get up to speed on the pro scene. Last weekend saw more amazing Overwatch World Cup action as groups C and D battled it out for a shot at a coveted appearance at the Blizzcon finals. The Sydney qualifiers took place from July 21 to July 23 and featured four powerhouse European teams in Sweden, Finland, Spain and Portugal. The banter between Sweden’s Reinforce and Spain’s Harryhook before their semifinal matchup was hilarious, as each Overwatch veteran talked some friendly trash about the other’s team. Overall, the production value of the event was top notch, though the desk commentators were a bit awkward if you asked Twitch chat. Sweden and Australia won their entry to Blizzcon in the end, leaving the home crowd happy. It wasn’t too much of a surprise to see these two teams meet in a semifinal matchup. Sweden was favored to make it to Blizzcon long ago with their four Misfits that have played together for quite some time. Spain had an excellent shot-caller and hitscan player in EnVyUs’ Harryhook, but that was also a bit of a weakness. His teammate, Chipshajen, is one of the best support players in the world and, well, he was playing for Sweden, no doubt uploading the necessary intel to the rest of his team. Conspiracies aside, it was one of the best matches of Overwatch I’ve seen in some time. The one thing I enjoy more than anything when watching Overwatch esports is that Mercy isn’t used all that often. Pro players understand that every other healer in the game brings much more attractive tools to the table, and they make those tools shine! Though Ana isn’t quite as meta as she once was, many teams still use her on defense for burst healing. Sweden did just that on Hollywood, letting Chipshajen show the world how it’s done with the Overwatch grandma. Good night, Toxiken. Chips with the absolutely disgusting 360 sleep dart on the run, Cwoosh on janitor duty. These are the individual plays that Sweden was pulling off with ease throughout the tournament. If it wasn’t Chips, it was Tviq. If Tviq was getting shut down, Cwoosh picked him up. Another thing that Sweden did a better job of was controlling space. Reinforce and Manneten were the kings of engagements, opening up Spain to a lot of unpleasantness from Tviq and Cwoosh. Even though many pro and amateur players are starting to get bored of the dive meta, you can’t deny how effective a good Winston-D.Va combo is. With Linkzr flanking, Fragi opens up some space in front of the payload with an Earthshatter, taking Lucio out of the equation and getting the assist on Winston with a charge. Linkzr finishes off the play by winning a duel against Zenyatta, something that’s a lot harder than it sounds for Tracer. Two tanks and three DPS? Why not? When they say that Overwatch allows for creativity, this is the sort of stuff they’re talking about. It translates well to the competitive queue in that you’re often stuck with strange compositions that are DPS heavy. Though people might scream and moan, it’s not always such a bad thing if you commit to it and find a way to make it work. Here, Genji, Tracer and Reaper are boosted onto the point with a sole Lucio for heals. 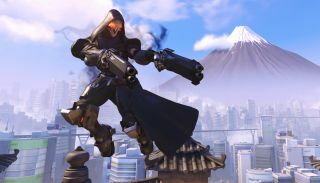 Reaper’s new lifesteal mechanic keeps him up and lets him pick up what the other DPS leave behind. One fan on Twitch joked that Italy got “calzowned”. Clever. We’re in for some fireworks when the Overwatch World Cup returns from Poland. From August 4 to August 6, you can watch two of the most stacked teams in the world fight for bragging rights in Katowice. One of them is South Korea. I mean, what else is there to say? With players from Lunatic-Hai, LW Blue and Afreeca Freecs Blue, many have them winning the cup this year. But the South Korean giants can’t sleep on the Canadians, who bring the best from Immortals, Cloud9, Renegades and Arc6 into the fray. One team that hasn’t received too much attention is Russia, but their roster has a lot of talent that can’t be overlooked. FaZe, eUnited and Bazooka Puppies all lend their talent to the Russian Overwatch team, and it might be enough to sneak up on some of the other favorites to win. As we’ve already seen in the Overwatch World Cup, sometimes it’s the individual plays and one-on-one fights that end up winning games, so anything is possible. One thing is for certain: we are going to see a lot of stellar Genji play between Canada’s Agilities, Russia’s ShaDowBurn and South Korea’s Fl0w3r. Katowice might have some of the most intense matches of the tournament yet.